The caption on the photo explains that the BB gun is fake and made of wood so "he did not shoot an eye out" when the photo was taken. SHELBYVILLE, Ind.—A photo taken by an Indiana photographer is so cute it looks like it was taken straight from the scene of a movie. Actually, the picture was supposed to be a scene from the popular classic film 'A Christmas Story." 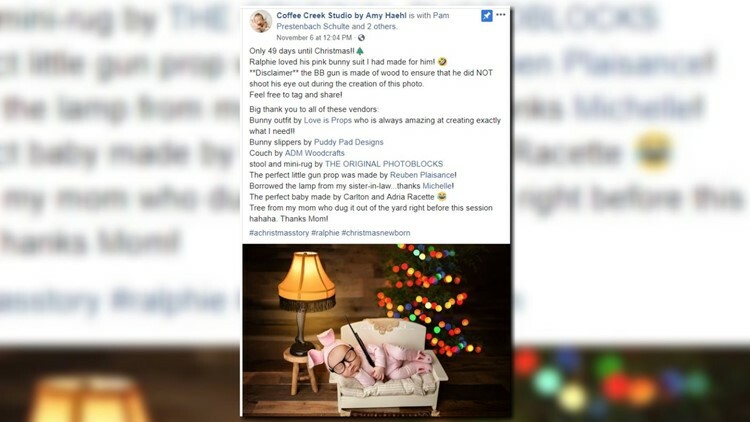 The photo has a baby boy dressed in a pink bunny onesie set up in miniature furniture, and, oh yeah—he’s holding a B.B. gun. The photographer, Amy Haehl, posted her work to her Facebook page and was got a lot of heat. The caption on the photo explains that the BB gun is fake and made of wood so “he did not shoot an eye out” when the photo was taken. That didn’t stop people from sharing their concerns about a baby holding a gun. The photographer also got a lot of positive feedback from her post. One commenter even said if they had a newborn they would fly the photographer out to Albuquerque to take photos.